Most of the 4 to 5 year old kids at the preschool knew when I asked them that ice and snow are made of water. I guess at some point they had figured that mystery out. 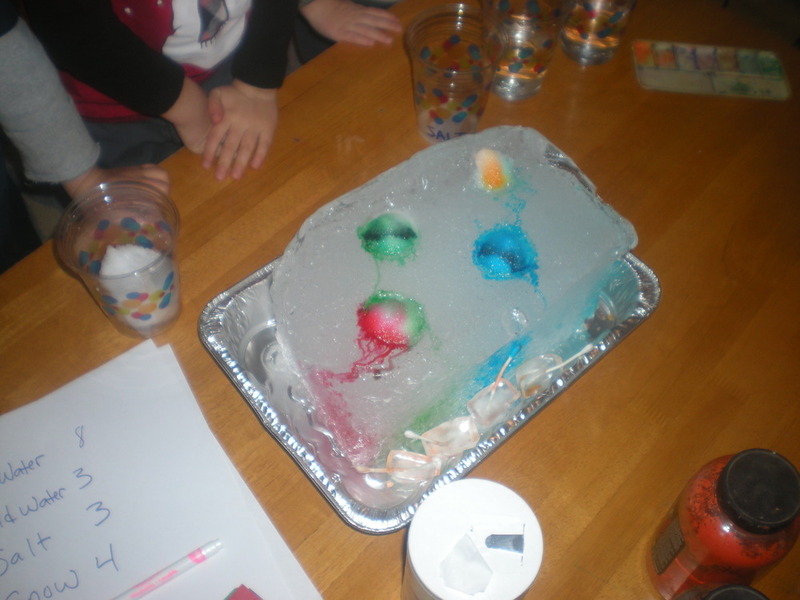 Here is another lesson plan for a fun day of experimentation and art from our snow and ice unit last month. One day in late January we decided to play with ice and see if we could affect how fast it melts. On a table I set out four glasses. One glass had hot water in it, another had cold water, another had salt and finally the last had nothing. Next I explained that we were going to put an ice cube in each glass and then watch to see which one would melt first. While we waited for our results, we set up another experiment and this was the best part of the day. I brought in a big block of ice that I purchased at the local grocery store. I set the block in a pan on a table. The kids felt the ice, running little curious fingers over the frozen block. Then we made little piles of salt on top of the ice block. On to each pile of salt I put a few drops of food coloring. A different color for each pile of salt. Right after we put the salt on the ice, the ice started quietly crack. "Oh listen, you can here the salt melting the ice!" 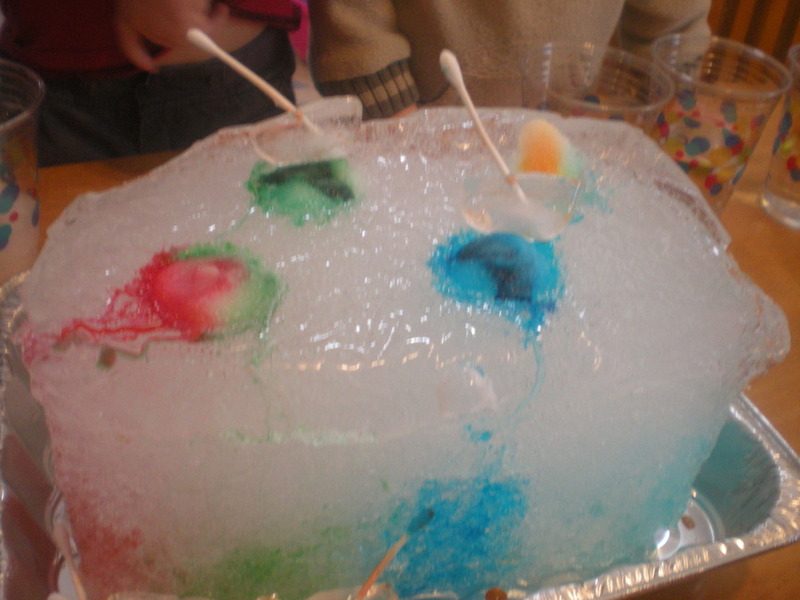 Fifteen preschoolers instantly became silent listening to the ice crackle. While we did this, I asked the kids if they had ever seen people put salt on sidewalks? Lots of nodding, "yes". We talked about how salt on the ground melts ice and keeps the sidewalks safe for walking on. So, what will the salt on our ice block do? "Melt it!!!" the kids replied. And that is exactly what happens. It is so cool because as the ice melts beneath the piles of salt the food coloring spreads through the ice and makes really neat patterns. Now we needed something to do while the salt melted into the ice. So we painted with ice cubes and the ice cubes were the paint brush for this activity. This is very hands-on and really demonstrates that ice is in fact made from water. I had frozen Q-tips into the cubes. 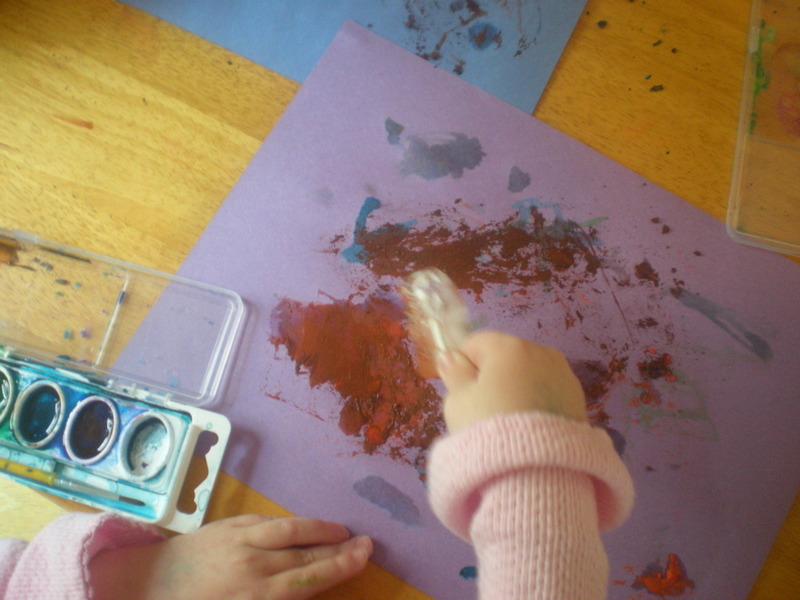 The Q-tips provide a handle while painting and help keep little hands from getting to cold. We used dry powdered tempera paint and pushed it around on paper with the ice cubes. At first, nothing happened and I had to urge the kids to be patient. But after a few minutes the ice began to melt and turn the powder into liquid paint! We also used water colors but this wasn't has effective as the powdered paint. I just wish I had a picture to share of that big block of ice once it had melted for an hour or so. It was really cool!